I brought home the new NAD M10 yesterday, and up until then I had ZERO problems with the Windows app. I used it to run my desktop Powernode 2, worked flawlessly. I would also transfer its play queue to either my T758v3 or Vault 2, no problems. Now I'm getting frequent failures on launch where it fires up, shows me the "Looking for players" for a few seconds, then goes to the black screen with Bluesound logo and text reading "24-bit High Res Music. In every room. Wirelessly. ", and that's all I get. I have tried rebooting the computer, uninstalling and reinstalling the app, powering off the M10. Nothing works until it feels like working. No rhyme or reason. It failed all last night, so I had to use my android devices (phone & tablet) to run the M10. It started up just fine this morning, but when I got home from work late this afternoon it wouldn't (and won't) work again. I have discovered that if I leave the M10 in it's "full standby" mode of screen off and top indicator light red by virtue of having pressed the standby button on the back, then open the desktop BluOS app, the app then finds my T758v3 and Vault 2 immediately. I then turn on the M10 and it finds that. If the M10 is already on and connected (top indicator light white), that's what freezes the desktop app! This is absurd, but it's a fact. So I have a workaround, but this should be the case. Hi Ken, you must be among the very first to own this. How would you compare the SQ to the Powernode? I have nothing bad to say about the Powernode 2. It's an incredible bargain for what you get. This M10 for 3x the price is not a linear 3x better, but...OMG is it better! Apart from the obvious looks difference, the first thing I noticed was how nice the volume control is on the M10. Very progressive rather than jumpy. With the unit's on-screen display, that's even nicer. The ESS Sabre DAC seems smoother too. The amps are clearly more powerful, though not something I can use in a desktop application. I can sense the headroom. The unit's display can show temperature of each channel's amp! 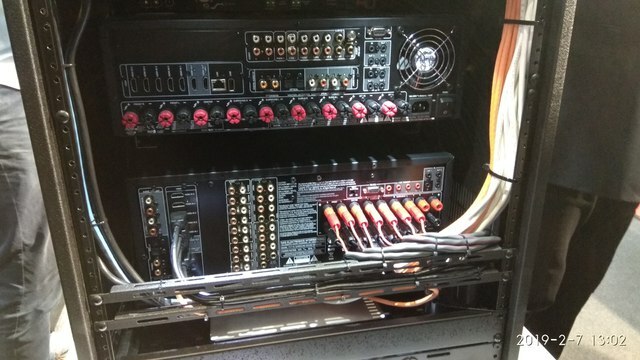 I was attracted by the looks, specs, and Dirac Live. No regrets yet! Oh, sound quality? Let's just say I didn't believe the could be a lot of difference in one Class D amp to the next. I might be very wrong. Let us know how you get along with Dirac going forward. 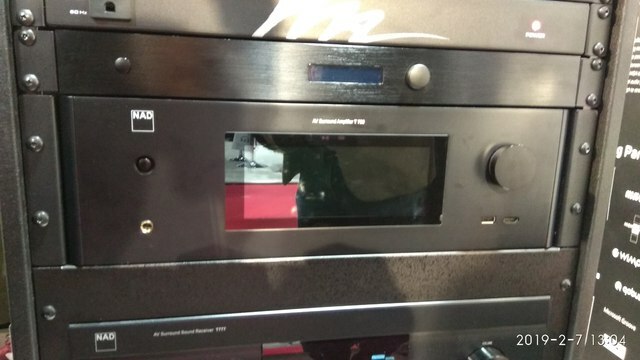 Talking about brand new BluOS/NAD products, I am very keen on the T789 which I gather is Lenbrook's next BluOS and DIRAC equipped NAD AV Amplifier, hopefully meaning an integrated BluOS experience rather than the external BluOS upgrade kit for T758/T777/M17. That's off-topic but I'll be looking for more info. My T758v3 is doing great job for now. What I've been able to determine so far is that if I keep the M10 in the full standby mode (red-orange top plate indicator light) while I get my PC fully booted up and the Windows 10 Bluesound app opened, then when I turn on the M10 it then appears among the 3 Bluesound players as it should. If I have the M10 on and active, I can only control it via Android apps on my 2 mobile devices. Because it's so common for me to inadvertently close the Bluesound desktop app, I've learned just what happens and what the "workaround" needs to be. If I do close the app, I must power down the M10 and have it off as I reopen the app. Once it's started, it proceeds to find the T758v3 and Vault 2. I then press the standby button on the back of the M10. Once that has started up and it's on the main screen, I can now select it as the active player. I will start a help ticket with NAD because I'm not getting any response here from the Bluesound team. I pray this isn't going to be a case of two sister companies blaming the other for the problem and nothing gets fixed be either one. Hi M10 here also, trying desktop, same problem. I am using wired network to both PC and M10, do they need to be WiFi to work with the PC Desktop ? Mine is connected via Ethernet, and I do have wireless but my PC is an older (2011) desktop that doesn't have a wireless adapter. It's also on Ethernet. The new update today didn't fix anything, but actually got worse in one way. Now when I click on "Settings" then "Player", I should see several options, one of which is "Audio." Instead, I get a blank page. I again had to leave my office and get my Android tablet from the living room to be able to turn subwoofer output back on. I opted to click on "Help" and "Send Support Request" because I am getting ZERO response here from the Bluesound team.